Located in the Oklahoma Panhandle, Cimarron County contains the only community in the state ( Kenton) that observes the Mountain Time Zone. Black Rock Mesa, the highest point in the state, is in the northwest corner of the county. Throughout most of its history it has had both the smallest population and the lowest population density of any county in Oklahoma. Black Mesa, the highest point in Oklahoma, is in the northwestern corner of Cimarron County. According to the U.S. Census Bureau, the county has a total area of 1,841 square miles (4,770 km2), of which 1,835 square miles (4,750 km2) is land and 6.1 square miles (16 km2) (0.3%) is water. It is the fourth-largest county in Oklahoma by area. It also has Oklahoma's highest point at 4,973 feet (1,516 m) ( AMSL) on the Black Mesa. The Boise City Airport is located approximately four miles north of Boise City. Cimarron County is the only county in the United States that borders four states: Colorado, Kansas, New Mexico, and Texas. As a result, Cimarron County is the only county in the United States to border at least five counties from five different states (one from each of the four aforementioned states, plus one in Oklahoma and a second county in Texas). ^ a b "State & County QuickFacts". United States Census Bureau. Retrieved November 8, 2013. ^ a b c d e f Young, Norma Gene. "Cimarron County," Encyclopedia of Oklahoma History and Culture, 2009. Accessed March 28, 2015. ^ From United States Geological Survey sources, an area one mile southwest of Goshen, MA is 27.3 miles (43.9 km) from five different states, second to this Cimarron County location. 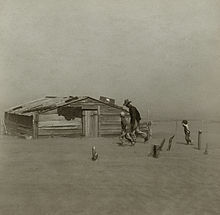 ^ Oklahoma's True Grit Dust Bowl Family, 77 Years Later; 405 Magazine. ^ Leip, David. "Dave Leip's Atlas of U.S. Presidential Elections". uselectionatlas.org. Retrieved March 28, 2018. Egan, Timothy (2006). The Worst Hard Time: The Untold Story of Those Who Survived the Great American Dust Bowl. Boston: Mariner Books. ISBN 0-618-34697-X. OCLC 58788898. , includes much about the history of Cimarron County in the 20th century. Wikimedia Commons has media related to Cimarron County, Oklahoma.